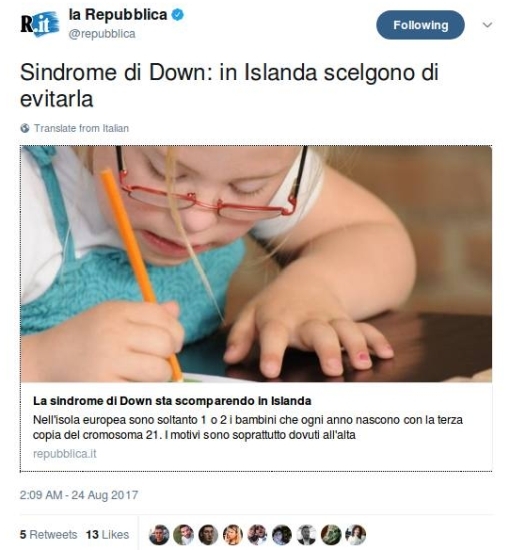 And avoid it they do: The tweet-text below the picture goes on to report how only 1 or 2 babies afflicted with that genetic irregularity are born in Iceland each year. Those with Down syndrome nearly always have physical and intellectual disabilities. As adults, their mental abilities are typically similar to those of an 8- or 9-year-old. They also typically have poor immune function and generally reach developmental milestones at a later age. They have an increased risk of a number of other health problems, including congenital heart defect, epilepsy, leukemia, thyroid diseases, and mental disorders, among others. Icelandic babies, then, are to a remarkable degree spared such anguish* – innocents spared a stunted (and likely shortened) life assigned purely due to the cruel vagaries of chance. Perhaps even more significantly, Icelandic parents as well are spared what are certainly the much greater – and longer – demands on them, both financially and emotionally, to support their child in living as happy a life as he or she can.